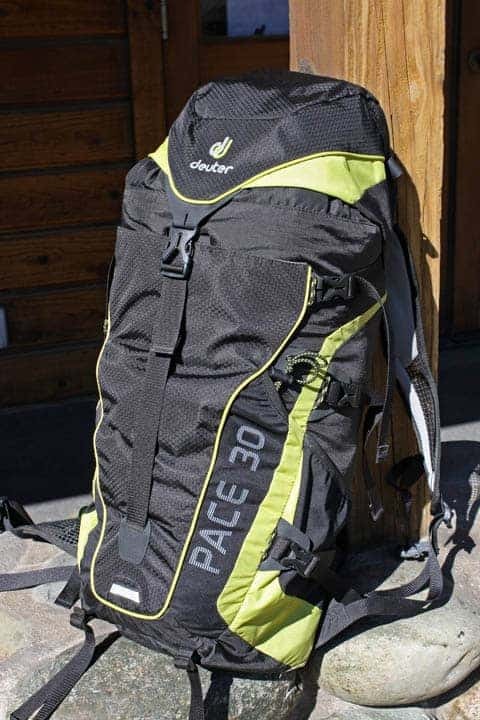 At the beginning of the summer, in search of the holy grail, do-it-all, best daypack to beat them all, I came across the Deuter Pace 30. My trusty Deuter Pace 30, stuffed to the gills. I wanted something I could use for hiking, hauling photo gear, climbing and backcountry skiing — a lot to ask out of one pack. 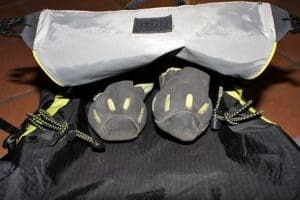 Oh yeah, and I wanted it to be lightweight — a lot of multipurpose bags out there start to weigh more than multiday packs with all the bells and whistles. The Deuter Pace delivers, ticking all the boxes without adding on the weight; it comes in at 2 lbs. The material is light without being tissue-paper-esque, like some other ultralight packs, and the suspension is a simple yet effective flexible tension hoop. No, you wouldn’t want to drag this pack behind you up rock on a multi-pitch trad route (where burlier fabric comes into play), and you need to pack it with some thought so your gear isn’t poking into your back (see heavier-duty suspension), but for me, these are worthwhile tradeoffs for shedding two to three pounds. Looking at the back panel and suspension. The added bonus of the basic suspension is that the pack flexes, moving with you, not acting like an EMT’s backboard, holding your spine rigid. 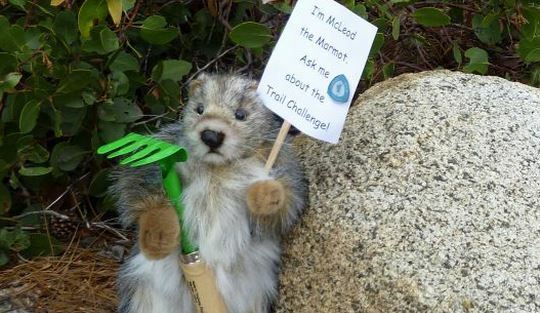 When scrambling over tallus fields, this is a big boon. The suspension does transfer the load to your hips, wrapped by two open mesh hip belt wings, that seem to give the support of bulkier foam designs without the weight and with the added bonus of incredible breathability. Same goes for the shoulder straps, where the open mesh is only interrupted by foam briefly where the straps rest on top of your shoulders. Foam is placed only at pressure points on the shoulder straps, leaving open mesh to breathe elsewhere. Load lifters and a sternum strap round out the suspension for a very stable, comfortable layout. 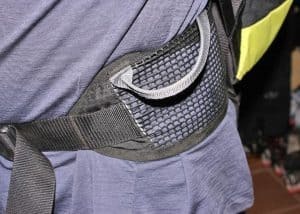 Back on the hipbelt, one mesh zippered pocket big enough for an energy bar, cell phone or other small item sits on your right hip, while a fabric loop, like an unstiffened gear rack from a climbing harness is on your left. Throw a small carabiner or two on there and you’ve got a convenient place to hang anything from climbing gear to your hat. Alternatively, the hipbelt can be buckled back around the pack, out of the way if you’re wearing a climbing harness. Hip belt with gear loop. Two compression straps on each side have alternating buckles, so the straps can be wrapped around the front of the pack to meet in the middle, perfect for a snowboard, snowshoes or other bulky items. Clipped together on the sides, the compression straps are perfect for an A-frame ski carry. 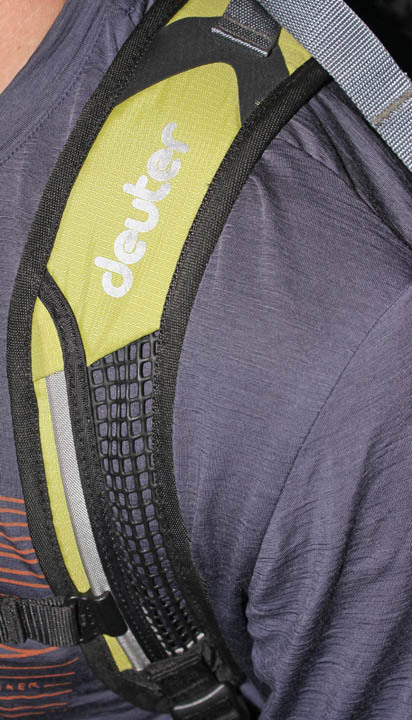 Here you can see the compression straps, with reinforced tabs at each edge to stand up to ski edges, and the stretch fabric water bottle pockets. A lot of skiing and climbing backpacks don’t have external water bottle pockets, but the Deuter Pace 30 has two low-profile, stretchy pockets that don’t have an open mesh that could catch or snag — pretty cool for bush wacking. On the front of the pack, a large kangaroo pocket is framed on the sides with the same stretch fabric, and will swallow a pair of climbing shoes, wet clothing from a dunk in the lake or a avalanche shovel, depending on the season. Besides the two compression straps on each side pulling tension into the pocket, a third set of straps at the top and a tab of hook-and-loop material keep its contents secure. A pair of climbing shoes inside the Kangaroo pocket. The main compartment has a hydration sleeve big enough for a 3-liter reservoir, and closes down with a cinch top. Over that, a lid with pockets inside and out closes the pack with a single strap down the middle, easier and less fiddly than a top lid with two straps. Last but not least, two ice-ax loops let you stow ice tools or trekking poles. 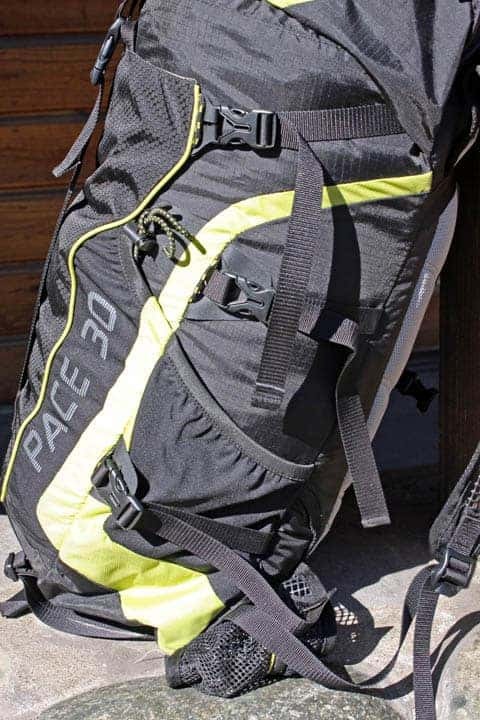 I’ve taken this pack on hikes in the Eastern Sierra, the Yosemite High Country and cragging on Donner Summit. It’s comfortably carried all the essentials of a day hike, along with an SLR camera, climbing gear and other odds and ends. When snow flies, it’ll replace my old backcountry ski pack that weighs nearly twice as much. 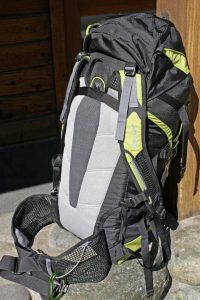 If you need to carry more weight, routinely find yourself dragging your pack over rough rock or just need something burlier, check out the Deuter Guide 35+ or 45+. 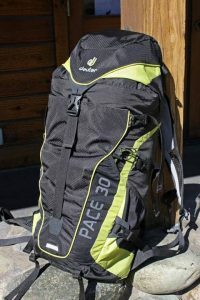 But if you want a pack that can do a little bit of everything without weighing you down, you’ll dig the Deuter Pace 30. ***** 2012 update, the current equivalent to this pack is the Deuter SpeedLite 30, featuring two hipbelt pockets (instead of the gear loop) and mesh water bottle pockets instead of stretch fabric.